Quick, name a spot to get some decent Italian food in Beverly Hills. Okay, that one was way too easy. There are only about 27,512. We’ve got your answer right here: introducing Taberna Mexicana, a welcoming hall of tequila and DIY tacos, opening tonight near Wilshire. If you’ve got a lunchtime pitch meeting coming up and Bouchon’s way too stuffy, come on in—grab a booth, start with a round of 7 Leguas shots and the finer points of your Tijuana take on The Hangover III will soon feel a little more authentic. But it also works for casual meals sans official business—like when you’re shopping at Barneys and you’re stricken with an intense craving for margaritas and some Deconstructed Tacos. (Known as the “Barneys Effect.”) The meat comes in pots, the tortillas are warm and fillings like pickled carrots and grilled jalapeño are on the side, so you can customize. 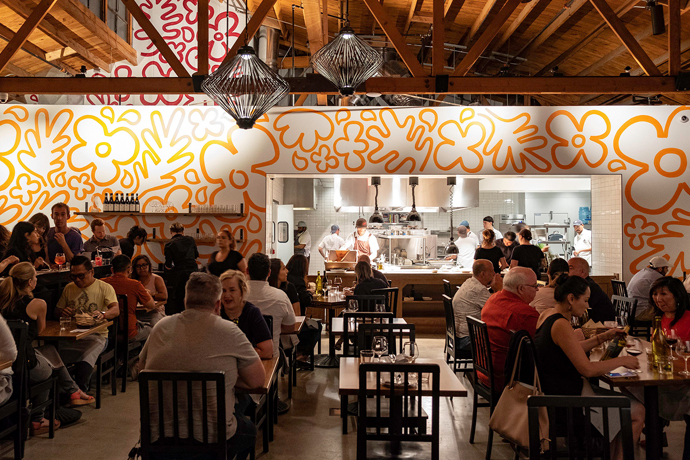 And if you decide to go full-on feast—scallop ceviche, lamb shanks, Caramel Tres Leches topped with blowtorched marshmallows—just know that this is the kind of place that uses olive oil instead of lard. Beverly Hills is fancy like that.